For some useful ideas for things to do with you pumpkin seeds check out The Kitchn. • 1 Roast them: Here’s a basic recipe from Whole Foods; also check out this good tip for brining the seeds first. • 2 Hull them: Need a quick way to hull a bunch of seeds? Heritage Farms has the answer. Pictured: Candied Pepitas (Sunset). via 12 Things To Do With Pumpkin Seeds Recipe Roundup | The Kitchn. This entry was posted in Food and tagged pumpkin seeds by Julia. Bookmark the permalink. I love this site…I’m 64 have built a house more than 30 yrs ago and am now in an unsavory place, but I will be going back to our Mother.. Thank you Lana. Building your own home must have been really rewarding experience. I’m sorry to hear about your current situation. I had just said to a friend, “Each new day has the promise of possibility for something spectacular happening.” I hope that happens for you as well. 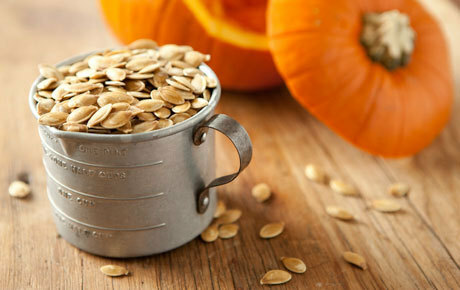 ““12 Things To Do With Pumpkin Seeds | Homestead Style”?